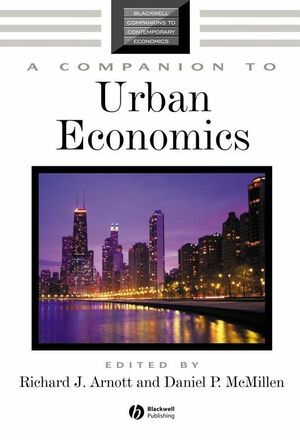 A Companion to Urban Economics provides a state-of-the-art overview of this field, communicating its intellectual richness through a diverse portfolio of authors and topics. Richard J. Arnott is Professor of Economics at Boston College, Massachusetts. His recent research focuses on the economics of urban transportation and he is author of Alleviating Urban Traffic Congestion (with Tilmann Rave and Ronnie Schöb, 2005). He has extensive editorial experience, including serving as an editor for the journals Regional Science and Urban Economics and Journal of Economic Geography and for the books Public Economics: Selected Papers by William Vickrey (1994) and Economics for an Imperfect World: Essays in Honor of Joseph E. Stiglitz (2003). Daniel P. McMillen is Professor of Economics at the University of Illinois at Chicago, and a member of the Institute of Government and Public Affairs. His articles have been published in such journals as Review of Economics and Statistics, Journal of Urban Economics, Regional Science and Urban Economics, Journal of Business and Economic Statistics, and Real Estate Economics. He is co-author, with John McDonald, of Urban Economics and Real Estate: Theory and Policy (Blackwell, 2007).